This easy Berry Trifle Recipe makes the most of in season berries and is the perfect summer dessert! This Easy Berry Trifle recipe is based on one of the most popular no bake dessert recipes on my site – my simple Trifle Recipe and it really is no wonder so many people love it! This Trifle recipe is perfect if you are feeding a crowd (you can get 10 serves from it) and it REALLY is incredibly easy to make – I promise! 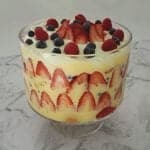 When making this easy Berry Trifle recipe you can really be as creative as you like when it comes to adding the layers, I like to thinly slice the strawberries lengthways to decorate the sides of the serving bowl, however if you are pressed for time, you can easily skip this step. You can also use either homemade or store bought custard for this recipe, you will just need around one litre in total. If you are making this Berry Trifle for a special even (eg Christmas!) you can also put it together the day before, just cover it with some cling wrap to help stop the whipped cream from ‘drying’ out. For more Easy Trifle recipe ideas, make sure you check out my Classic Trifle and Chocolate Trifle recipes. This easy Berry Trifle Recipe makes the most of in season berries and is the perfect simple summer dessert! Make your jelly as per the packet instructions and pour it into a large bowl and place into the fridge to set. Cut the jam swiss roll into 1cm pieces. Thinly slice the strawberries and set aside until needed. Place the cream, vanilla extract and icing sugar into the bowl of an electric mixer and beat until soft peaks form. Set aside until needed. Arrange 1/2 of the jam swiss roll slices over the base of a 3L serving bowl and top with 1/2 jelly, 1/2 of the custard and 1/3 of the berries. You can arrange the sliced strawberries around the outside of the bowl for a nice effect. Repeat in the same order again to fill your serving bowl. Add a layer of cream on top and sprinkle the remaining berries over the top. Place your trifle into the fridge for a minimum of 4 hours, or overnight if possible. This recipe can be made a day in advance. Thanks so much, I hope you enjoy it!